When I see a beautifully manicured set of red nails, it conveys to me the image of a chic, polished and groomed woman. There is something about that colour that exudes style and elegance and once you find the right shade that suits you, it's one that you will keep going back to, time and time again. Red, is my fail safe colour and I own so many varying shades of red polish - from deep burgundy to bright blood reds, that I feel I am a connoisseur now of this colour of varnish! I used to have my own mobile nail salon business and by default now, I am someone who always notices peoples nails. If someone is wearing a good red nail (by 'good', I mean a non-chipped, non-smudged, no leakage onto fingers finish) I often associate them as someone who takes time and pride in their appearance. I think it can be a very flattering colour and can instantly complete an outfit. In the winter you will often find me with deep wine/claret colours and in summer time I prefer the classic brighter reds. This red colour from Orly is what I would describe as a 'London Bus' red or 'Pillar Box' red. It is a very classic red and is bright and punchy. The lid is made of a rubber material which makes it very nice and easy to handle and manoeuvre with application. The formula is quite thin which stops you from applying each layer too thick. This means you would definately need to apply x2 layers to get the true density of colour - no quick application with this one! It dries to an almost 'glass-like' look and shine which is not completely opaque after 2 coats but does give a beautiful coverage. This polish I've noticed also dries very quickly which is a bonus. I love these new 'gel finish' varnishes that are everywhere at the moment which give you the look of a gel manicure straight from the salon. With this colour from Avon it again is what I would describe as a 'true red' although just slightly deeper than the Orly which you can't really see with this picture. It has a very rich consistency and is highly pigmented - with only just one coat you get brilliant density of colour and opaqueness! I am a creature of comfort (and tradition!) 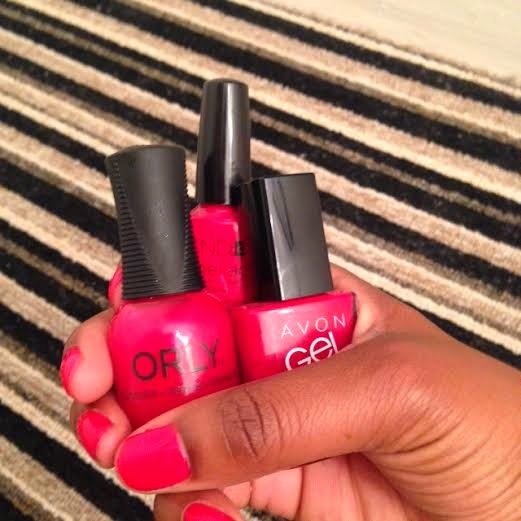 so I still use two coats and a top coat with this even though Avon have stated that with this range a top coat is not necessary - this varnish plays the role of base coat, gel colour and top coat all in one! Because of all this, this polish is brilliant if you are short on time. The thing to remember with these 'gel polishes' that are on the market now is that you do still have to be as careful with your manicure as a normal polish - they perhaps last just a teensy bit longer but of course nowhere near as long as the real thing! I had to include an actual Gel colour in this review as this is the red that I always wear on a regular basis. Wildfire by Shellac is for me the best classic red out there and you really can't beat the non-chip, non-smudge, no waiting to dry time that you get with a gel manicure. Granted, you do need to shell the pennies for this one and get this done at a Salon as it does need a UV Lamp to 'cure' (dry and set) each layer but I love the versatility a gel manicure gives you. (As I still have my kit from my nail technician days, I am lucky enough to be able to do my Shellac nails at home myself!) . I get about 10 days from my 'Shellac' before the regrowth or chips start showing. So, if you haven't tried a red nail yet because you are perhaps scared of the maintenance that is required with non-neutral shades, give a Gel Manicure a go. There are also so many variations of reds out there with the 'normal' varnishes that there is sure to be a red to suit everyone.